One day, I looked inside my wallet, and there he was. Click here to play! He blinked as he looked up at me, dazzled by the light of day that he was seeing for the first time. Then, quick as a flash, he gave me a wide smile, pointed at me with both hands and said, "Sandwiched between two fine $10 bills and feeling fantastic, buddy." He then winked at me, and from that moment on we were best friends. Me and my friend Cool Buck, who has made me the richest man in the world today. 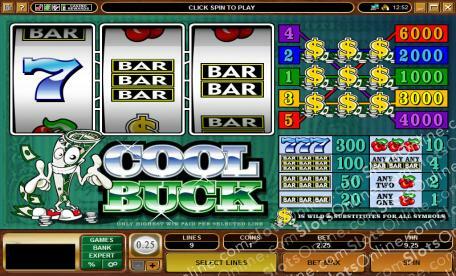 The Cool Buck slots are fun 3-reel classic slots with 5 paylines. The theme is money, and particularly a cheeky little character named Cool Buck. Providing many ways to win while remaining easy to understand, the Cool Buck slots are great for players who find single payline 3-reel slots don't offer enough action while 5-reel slots with multiple paylines are too confusing to follow. The Dollar Sign symbol is wild and substitutes for all other symbols.